My good friend Nancy Higgins recently screened her film Viva Les Amis as part of a showcase put together by my other friends at SXSW. The film is a great look at something that seems to happen everywhere - the replacing of a great cafe by a Starbucks. Well, it's not that simple. 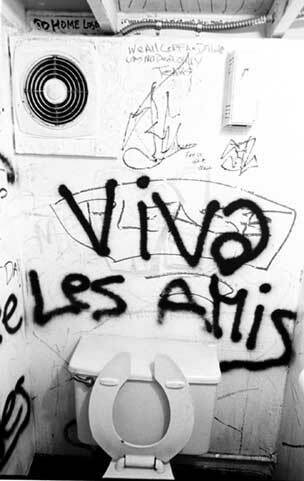 Les Amis was a cafe in Austin, Texas that was the quinessential college town cafe - run by quirky characters, worked at by drunks serving cheap food to other drunks and providing a place for slackers, punks and probably some students to hang out. And it was slackers - in fact, Linklater's Slacker featured the cafe prominently. As the town got less weird, contrary to the current shirts proclaiming to "Keep Austin Weird," the cafe eventually closed down. High rents being a major part of the problem. Today, a Starbucks sits on the site. No, Starbucks didn't force them out, but like so many other places, they benefitted from the changing demographics of the town. What makes this film great is that Nancy doesn't just play to the stereotype of the evils of gentrification, changing populations and green logos. She explores what the cafe meant to residents, but she also takes time to get to know the new employees of Starbucks. They are much more sober, but also have better health care, than the workers from Les Amis. She also fashions a film that becomes interesting to others than Austinites or Slacker fans. The film is about the dying of a culture, the changes that inevitably face any town that starts to grow and serves as a testament to the importance of the smaller things in life. It's great regional cinema - little films that say big things by focusing on something seemingly insignificant. The film was recently programmed in Austin at the Alamo, and in Orlando at the Global Peace Film Festival. You can purchase the DVD, or just watch the clips online, but either way - you should check out this film. TechCrunch reports that the rumored sale of YouTube to Google is complete - in an all stock deal worth 1.65 Million. While many people, like Mark Cuban, wonder whether YouTube is worth such a price, you have to believe that Google spent millions in legal fees just contemplating whether this deal would land them in court and - if so - whether they could win any lawsuits. When Google announced the Google Book Project, the Author's Guild and others were quick to sue. My old friend from Atlanta, Joe Beck, is defending that case, and I'm willing to bet he'll win - he won for the Wind Done Gone, and in some ways that may have been more difficult. I'm sure that many a distributor will sue Google - its what you do when you are dying and scared - but I don't think Google scares easily. It may be too much to dream, but I hope that the content industries start to wake up and realize that everyone will benefit from some changes to the rights-control-regime. Some money is better than no money, and could possibly be mo' money. I don't believe that advertising alone can support all video, we've seen how that works with TV - not everything gets supported, so there are definite tiers. But we also learned that people will pay for good content (HBO), and we've even seen that people will pay for what they can get for free with video (through sales of TV shows). While YouTube will probably always have illegally posted material, it also shows a demand - for content that's hard to find, for content made outside the system, etc. I bet Google could figure out a variation of the ideas proposed by Terry Fisher in Promises to Keep. 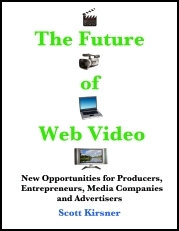 Perhaps some combination of free, taxes or license fees for certain copyrights and fee-based video. More thoughts on this soon, but this will be one of the more interesting business developments for film/video in years. Maybe this will get me posting more often than the once a month average I've had this summer. There's been a lot of talk lately about how new technology is leveling the playing field - from low cost cameras aiding production to new modes and methods of distribution. I've read and heard proclamations about how anyone can now distribute their content and that gatekeepers are going the way of the dinosaur. If you look at things like OurMedia, Revver, YouTube or Eyespot it does indeed seem that anyone can bypass the gatekeepers, or become one, easily now. While no one has made a business model that allows someone to make a living from putting their stuff online yet, all of us can imagine this potential. "The forest of hundreds of startups gets burned to the ground, and only a few old trees like Yahoo and Microsoft are left standing. This is the same UN agency that created the DMCA and EUCD, the laws used to jail crypto researchers and shut out tech companies that want to make interoperable technology, that let the Church of Scientology and others censor web-pages by claiming that they infringe on copyright. They're the most deadly enemies the Internet has. They claim they're acting on your behalf." The worlds of policy, intellectual property and global politics can seem hard to figure out, but it's not that difficult - it's just obscured. Keeping us in the dark is what keeps these companies in control. It's time filmmakers and their friends (audiences, fans and advocates) start paying attention to both the national and global policy debates, because otherwise you'll wake up in two years with less options for distribution than you have today. This isn't a joke - you may no longer have places like OurMedia to share your film for free, much less any new business model that let's you use the power of the web to skip the gatekeeper and go directly to your audience. Net neutrality is bigger than just this issue, it also includes things like giving faster service to those who pay higher fees, insuring that iTunes (for example) gets video to you more quickly than some low-budget indie filmmaker. It means the internet may become more and more like a big, dumb television that just lets you find shows quicker and link to advertisors more easily. All of it is being decided now, in US and World courts, treaties and behind closed doors. What can you do? Well, keep informed through places like Cory Doctorow's blog on BoingBoing, or even better sign up for the Free Press net neutrality coalition - Save The Internet - and get active. You can do so at this link. If the news about the Smithsonian deal wasn't bad enough, the Electronic Frontier Foundation (and others) have pointed out that under the WIPO Broadcasting Treaty being considered now, any public domain work used in this agreement could become copyrighted - and controlled - by Showtime for 50 years. "If adopted, the WIPO treaty will give broadcasters 50 years of copyright-like control over the content of their broadcasts, even when they have no copyright in what they show. A TV channel broadcasting your Creative Commons-licensed movie could legally demand that no one record or redistribute it -- and sue anyone who does. And TV companies could use their new rights to go after TiVo or MythTV for daring to let you skip advertisements or record programs in DRM-free formats. If that wasn't bad enough, the US contingent at WIPO is pushing to have the treaty expanded to cover the Net. That means that anyone who feeds any combination of "sound and images" through a web server would have a right to meddle with what you do with the webcast simply because they serve as the middleman between you and the creator. If the material is already under copyright, you would be forced to clear rights with multiple sets of rightsholders. Not only would this hurt innovation and threaten citizens' access to information, it would change the nature of the Internet as a communication medium." It looks like the Smithsonian has (probably accidentally) just sold their public domain holdings to Showtime in addition to their other works. Now, in addition to a bum deal for indies who want to make a film using Smithsonian work, tons of public domain work would become the property of Showtime screwing the rest of us as well. The NYTimes had a great article this weekend on the potential problems arising from the Smithsonian’s recent decision to pact with Showtime to create Smithsonian Networks. Smithsonian Networks will develop television programming using Smithsonian Collections and staff, and appears to be part of a VOD package from which both Showtime and the Smithsonian will profit. The deal also creates a new “right of first refusal” over producers hoping to use the same resources. In other words, if you want to make a film using Smithsonian archival items or quotes from their staff, they could stop you by saying they may want to produce the same type of film. This is a horrible threat to independent filmmakers. The article had quotes from famous filmmakers, such as Ken Burns, about how disastrous this could be for their filmmaking. But it’s not just heavyweights like Burns who are affected. Laurie Kahn-Leavitt, director of the film “Tupperware,” was told her film would have been denied under this pact. This deal let’s the Smithsonian decide on a “case by case basis” what films they will allow. What will be allowed? A spokesperson said that films with incidental and brief uses might be allowed, but the terms of the contract are confidential. In reality this means that if they think a film will be profitable, they won’t allow you to make it unless you work with them. While I am usually all for collaborations between for-profit and non-profit organizations, such deals are risky when they work to the exclusivity of others. The Smithsonian is a public archive, it was established specifically to spread knowledge throughout the world. It’s archives are a public trust, and they are funded as such – 60% of their budget comes directly from the Government as Federal Appropriations and another 15% comes from Government grants. That means from you and your tax dollars. So, the Smithsonian is using our tax dollars to create a public archive and is now turning around and selling it under confidential terms that limit the rights of anyone else to use it for the public good. This is absurd. It’s also something that groups like AIVF, IDA and IFP should be fighting as part of their mandate to help their filmmaker members. I haven’t spoken with any of them, and they may be planning to protest this action, but as I mentioned earlier, many of them are too cash-strapped to take on political action. Nevertheless, this is another example of an area where a strong support group for filmmakers could be of help –lobbying Congress, Showtime and the Smithsonian against this action. I haven’t see much press about this outside of Anthony Kaufman’s blog – so start telling your friends.